The National Basketball Association and its players certainly have no shortage of fashion ideas. As players like Russell Westbrook or LeBron James have shown, sporting a new style or trying to make a statement through clothing has become a norm in the NBA. However, not only can the off-the-court attire make a statement, but the on-court attire also can. Yes, the NBA has come out with new jerseys, such as the “city jerseys,” but it’s more about what they aren’t doing that is allowing the players to bring their own fashion sense to the court. This year, the NBA has loosened restrictions on the colors of shoes players must wear, helping to create an even more player-based model. For nearly the entire history of the NBA, the players have been required to wear shoes that are “51 percent white or black, plus a minimal team color accent.” Then, Michael Jordan stepped onto the scene. During his rookie year, Jordan wore a plethora of shoes that complied with the NBA’s “dress code.” Then, during the 1985 NBA Slam Dunk Contest, Jordan opted to wear a red and black model of what is now the Jordan 1. The NBA was unhappy with this decision and fined him. Nike, the shoe company that was sponsoring Jordan, paid the fine, and from that moment Jordan and Nike would start the process where the player and brand would make the NBA shoe rules. Because of this, the rules have progressed to a point where the players have been allowed to wear shoes that entirely match with the color of the team’s jersey, and shoes that match the “theme” of the NBA on a particular night, such as special Halloween or Christmas colored shoes. This year, the NBA has decided to dismiss these restrictions and allow its players to wear sneakers of any color whenever they so choose. Sneakers are, unsurprisingly, extremely important to the players. The sneakers must provide the right amount of support, comfort, style, etc. so that the players can perform at the highest level. Fans notice the most important piece of equipment a NBA player wears. 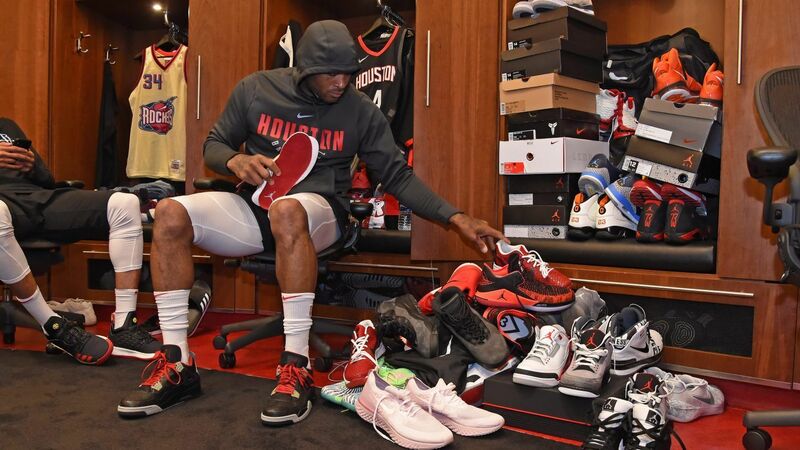 Words like Jordans, LeBrons, Kobes have become household references to the players’ shoes. Billions of dollars are spent yearly on basketball shoes. Basketball sneakers help drive culture. Countless blogs dedicated strictly towards which player has the best “shoe game” in the NBA are starting to become very common. Nice Kicks, a company dedicated towards sneaker news, even has a “Kicks on Court” champion, where they crown the NBA player who they think wears the best shoes throughout the year. The unanimous champion for the past three years has been PJ Tucker, guard/forward for the Houston Rockets. Tucker has been at the forefront of pushing the limits on not only what color shoes to wear, but the style of shoes players wear. He has worn everything: from rare models of Jordans and Kobes to the Nike Air Yeezy 2s, shoes that are traditionally more for style than basketball performance. When asked by ESPN about the rule change, Tucker said, “Those [rules] never really applied to me. I’m the same no matter what. I’ve always worn whatever, and kinda pushed the envelope. I’ve never really cared [what the league thinks]. So I mean, I appreciate being able to do it without having to hear anything. But that rule has never really bothered me. That, to me, is like an announcement for everybody else.” If the rule changes aren’t having any impact on Tucker, they’re certainly having an impact on other players, such as Los Angeles Lakers guard Kyle Kuzma. Kyle Kuzma is a second year player for the Lakers. He turned some heads this summer when he decided to sign a shoe contract with GOAT, the largest resale marketplace for sneakers. Kuzma is currently signed to Nike until 2019, but this move with GOAT certainly shouldn’t go unnoticed. Because of the rule change and Kuzma’s new deal, Kuzma will be able to choose any rare Nike he wants to wear in games this year. Kuzma was quoted in an ESPN interview, saying, “Now that the NBA has removed restrictions on the colorways we can wear on court, I can be as expensive as I want.” He has the freedom to choose any shoe he wants, and certainly plans to take full advantage of that.